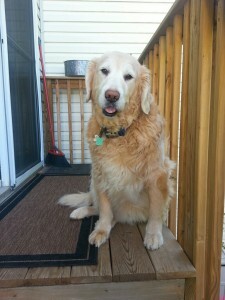 My name is Kristina and I am the proud owner of Dusty, an 8 year old golden retriever. We have had Dusty since he was 14 weeks old. From the day we got him he has been a very special baby. In Dec we noticed that Dusty was limping. We looked at his left paw and noticed that he had what looked like a boo boo in between his pads so we put some Hot Spot medicine on it to get it healed. About a week later we looked and it and the spot had gotten so big. So I called my Vet Dr. Johnson at Pet Center Animal Hospital to make an appt. We went in that day and was shocked to learn that this was not a boo boo but it was a tumor. Dr. Johnson advised me that this needed to come out as soon as possible. He setup the surgery for the next morning. He advised that there could be a possibility that he might have to take off Dusty’s foot. That was lot to swallow as you can imagine. Here I think I am bringing my baby in for a foot infection and be told that this is a tumor and that it is going to have to go to pathology too find out what we were dealing with. A few days after surgery we had to bring him in to get his bandages changed and he had developed an infection where his IV was. Also there was a blood clot that had formed. So we had to put him on additional antibiotics. About a week later Dr. Johnson called to give us the results of the pathology report. (It took longer than normal due to the holidays )lt was not good. He advised we had 2 options. He said that it was a plasma cell cancer and that we would need to have follow up treatment which would be radiation or we could do the waiting game and when it came back and it would, he would have to remove the paw to get rid of the cancer. Well to me that was not an option. As much as I hate the fact of Radiation that seemed like the best course of action to give my baby the best quality of life. He reached out to Dr. Gustafson and she advised him that if we got 15 treatments of radiation that she felt confident that would get rid of the cancer. Today Jan 30, 2013 we had our apt. with her to go over all this. So we setup the 15 treatment of radiation to get the cancer gone and not have to look over our shoulders. As you probably are aware radiation is extremely expensive. Dr. Gustafason recommends that we reach out to your organization to see if we could get come financial help with the cancer treatments for my Dusty. We would greatly appreciate any help financial help that you provide. We are willing to do whatever you need us to help. We can do fundraisers; we can help drive other families and their pets to Dr appts. My Dusty is the sweetest soul you would ever meet and he deserves to be rid of this nasty cancer and live a good quality of life. Our other Dog Teddy Bear died 4 years ago in May and I can’t stand to think of losing my Dusty as well. Our dogs are like our children. God blessed us with this beautiful baby and we have to give him the best care we can.